This week I celebrate movement. Literally, movement. Free from pain. Without stress. Regular, functioning movement. This winter holiday, I was hit hard by a pinched nerve that meant severe pain, limited movement, very little sleep and a numbness down to my thumb. It hit me December 24th and I am only now reentering the regular, physical functioning world. I have two full nights of sleep under my belt. My thumb sort of feels normal. I worked almost a full week. I am grateful to Scott, my calm and committed physiotherapist. And I celebrate my morning walks, my trusty heating pad and my ability to breathe through pain. I had thought that this week was going to be challenging. Yet, it was full of fabulous learning. Despite my commitment to getting home early to do my stretches, apply heat and relax, my classroom was buzzing with activity and excitement. For the first week back, we were on full speed ahead. Again, movement. Continuing towards independence, discovery and a strong classroom community. I need to go sit with my heating pad and my book but want to quickly share a few highlights of a positive first week back. 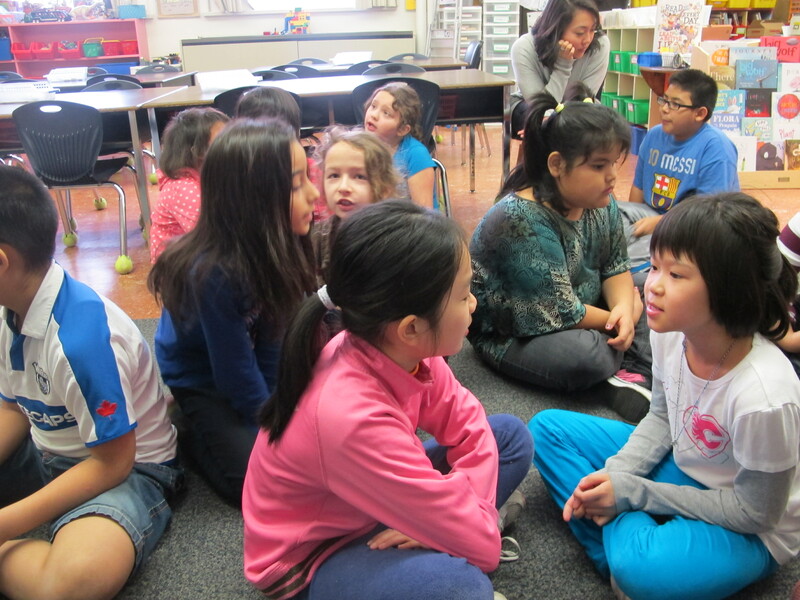 I am thrilled to have my students participating in a Mock Caldecott award process. We have eleven gorgeous titles on our list (follow the link above for our process). So far we have shared 4 of them. 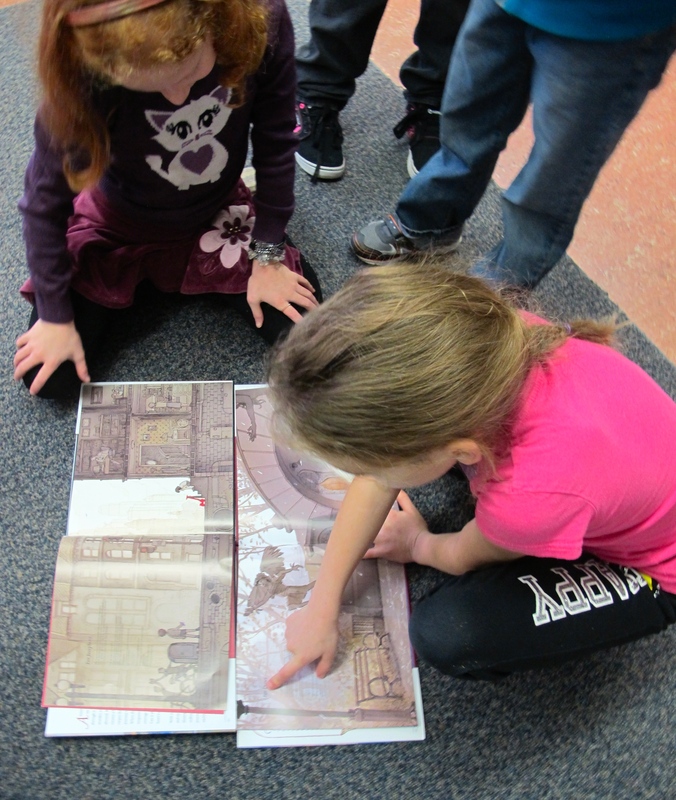 After we read Quest together, two students needed to compare it page by page to the beloved Journey (also by Arron Becker). There is lots of picture book buzz in the room! We missed our discussion about picture books on Wednesday because of a fire drill. Students begged me to do it today because they wanted to “talk picture books.” What could be better? The conversations were rich and on task. Lots of sharing and really listening to each other. So much engagement and enthusiasm for meeting up with our classroom library once again. 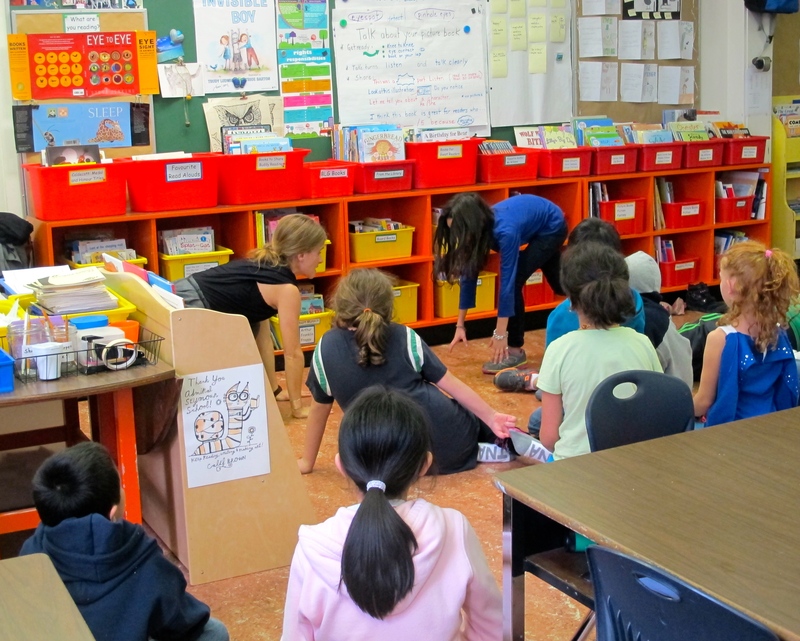 I am so lucky to have Miriam, who works with me in the classroom, bring yoga into our room. We did yoga almost daily this week and the children are able to be so much more present and confident. In the picture below, Miriam and a student are demonstrating a series of poses. This entry was posted in Celebrate this Week and tagged Celebration, picture books, Reading Workshop, yoga by carriegelson. Bookmark the permalink. Slowly but surely! It feels pretty great. “Wonderland of Books”…that is so AWESOME! I’m glad you are feeling better. Heating pads can be a gift from heaven! Isn’t that sign the best? Our room really does feel like that when we add in all of these enthusiastic little readers! Hoping you continue on the path of healing. Love the enthusiasm you’ve created in your readers. A true wonderland!! Thanks so much. They are wonderfully enthusiastic! It is really so great for all of us. Really a way to center. So happy you are back in better shape, Carrie. 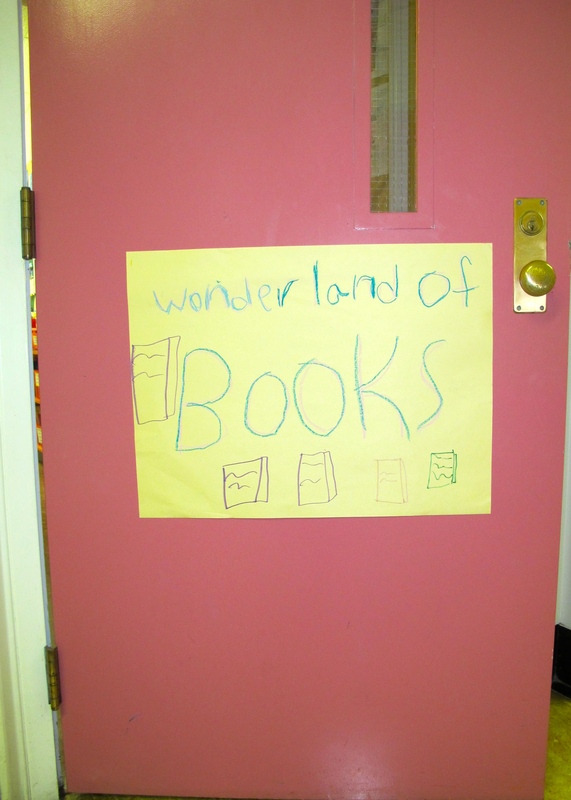 The pictures are exciting to see, but the best is that sign on the door: “wonderland of books” for sure! I love this sign too. I might ask her to do another one that I can laminate – didn’t want to interrupt this spontaneous gesture of creating it and immediately posting. I so enjoy seeing the pictures of your students reading picture books. As a picture book author, it truly warms my heart. So glad your back is better!! And what lovely work you are doing with your kiddos in spite of your ailment. You are an inspiration. 🙂 Love reading your posts. Wow, Julieanne, thank you. It has been a truly wonderful week back. Kids so keen and lots of great learning and thinking has been going on! Wonderful celebrations! That pain piece is so hard. Happy to hear you are on the mend. It is amazing what just a good night’s sleep can do. Makes me really appreciate the good health I can usually celebrate. “Wonderland of Books” – such a great place to be at. Sorry to hear about your pain. I am glad that you are getting better. Thanks Terje. It was more than a week of 24/7 pain and very little sleep so I am very thrilled to be on the mend! Love the WONDERLAND sign! Glad to hear that you are on the road back from pain. Mock Caldecotts – so exciting to see which book wins! I am very excited to see which one will win out as well.The kids are so open to each selection. They are very into the entire process. Makes me realize how much they know about books, story format, etc and how articulate they are in expressing their opinions and perspectives. Isn’t it? It is the best thing about my class – their enthusiasm for all of the literacy activities we do and their true, deep book love. Your classroom is certainly a magical place – even if you did not have a sign as a reminder! The concept of a WONDERLAND for learning is one that is near and dear to my heart. I hope we never forget that we all learn to read by reading wonderful, engaging books. ALSO, glad you are finally feeling better. That sounds like quite a siege of pain. Thanks Anita. I too believe that a classroom full of books and time to read them is the biggest gift I give to my students. My husband just went through the same thing so I totally understand your pain. I love seeing pictures of your classroom. Your students obviously share your passion of books, reading and learning. Hope you continue to recover quickly. Thank you Leigh Anne. Appreciate the understanding of how awful nerve pain can be. Yes, we are a room full of literary enthusiasts. So glad you are feeling better and getting back to normal movement. It is so hard when you feel less than 100%. I love the glimpses of amazing book love in your classroom. So much to celebrate! Thanks Andrea. It was a wonderful week despite not feeling “right” – lots to distract me from the discomfort. Such great pictures! My sixth grade daughter began doing yoga at school this week and she can’t stop talking about it. How fun to have an ‘expert’ right there in the classroom with you. Indeed, we are lucky. Miriam is an absolute gift! So happy you’re feeling better! What a miserable stretch of days–and nights, with no sleep. I’ll be starting a Mock Caldecott next week in my children’s lit class–so looking forward to it. Still trying to narrow down my book choices because I want to include EVERYTHING. 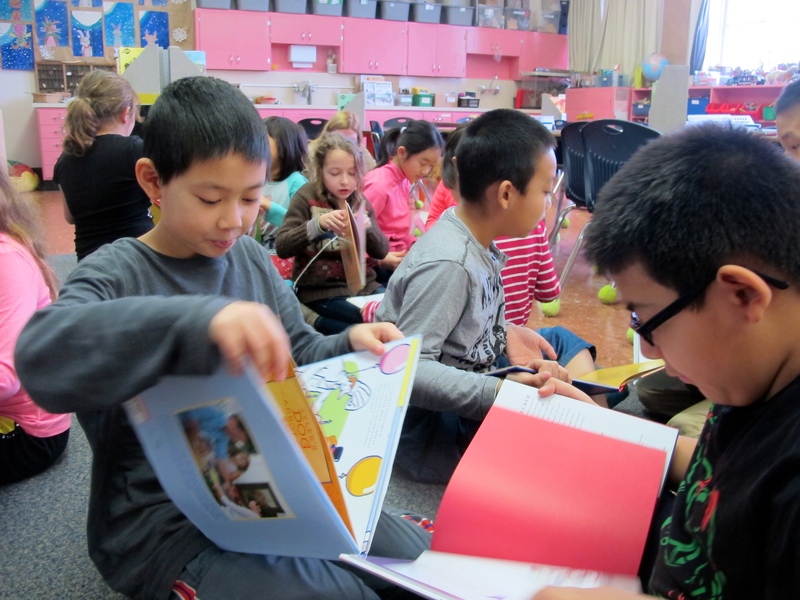 Love the photos from your classroom and reading about all that #booklove! It was very challenging to narrow down. But I knew that we couldn’t handle more than this many books in our time frame. Kids are keen so we will see what is chosen. Wow! Your students have clearly fallen under the magic of reading spell. I love the Mock Caldecott ideas. Glad you are feeling better Carrie! Thanks so much Susan. I think the children were really excited to get back to our classroom library and to our reading community. The have leaped right back into it! So glad to hear you’re slowly healing. I know how frustrating it can be when you just want to be better now. It’s amazing how much we take for granted. Great photos again this week! I love how invested your class always is!